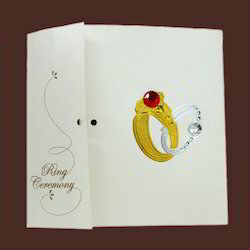 White card with ring moti & stone work. Envelope in white. - Approximate Height : 14 cm Width : 20 cm. - Approximate Net Weight : 20 gm. Price is inclusive one inserts, envelope & over printing. Our organization is the renowned name in the industry, involved in offering an assorted collection of Engagement Invitations Card. We are offering the best quality series of Engagement Invitations Card. - Weight - 29 gm. 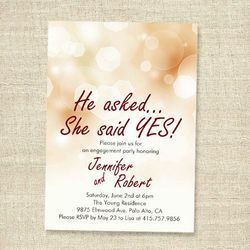 Owing to the rich industrial experience and expertise in this business, we are engaged in providing Printed Engagement Invitation Card. This elegant Upanayanam invitation, with graceful scripted lettering and simple color scheme, is the perfect choice for your sons big day. Please take a appointment to get your card designed by Templetree. We create all Invitations such as Corporate Show Invite, Wedding Invite, Business Startups etc.